A soaring turkey vulture. Photo taken at Eastern Neck Island Wildlife Refuge. 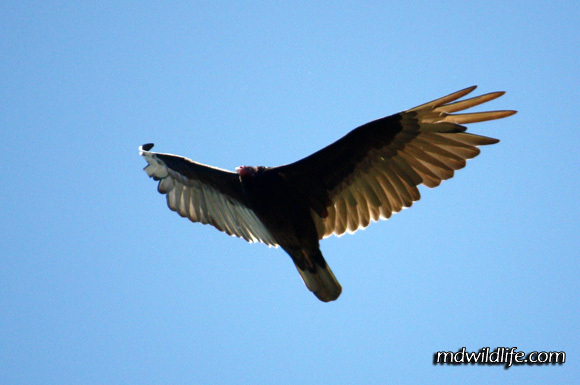 The Turkey Vulture (Cathartes aura) can be found across the entire state of Maryland in both the winter and summer months. I don’t think I have been to many WMAs – or even driven along too many Maryland highways – where I didn’t look up and spot a turkey vulture. I’ll see them during my hikes either on my way in, my way out or walking a trail. Turkey vulture framed against a treeline at Eastern Neck Island. They present a great photographic subject because they hardly ever flap their wings and supply a steady target, gliding effortlessly through the sky. There isn’t much movement to their flight at all. They are also a very large target with a wingspan close to 70 inches, which means you can still get a decent shot from a distance. 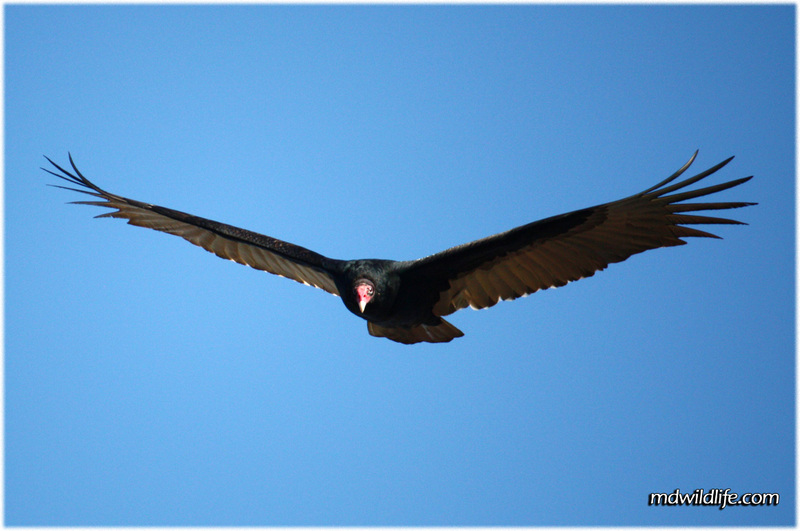 The Turkey Vulture usually sticks to concentric circles in flight, but will do an occasional pass or dive. I have seen them get pretty close to the ground, especially in an open field. The species is easily identitfied not only by its large size, by distinct coloring around the head and along its underwings. A red face and yellow beak, clearly distinguishes the Turkey Vulture adults. Juveniles have a grayer face and can closely resemble the Black Vulture, which is where the wing coloring comes into play. The underside of a Turkey Vulture’s wings shows very light, almost white feathers. 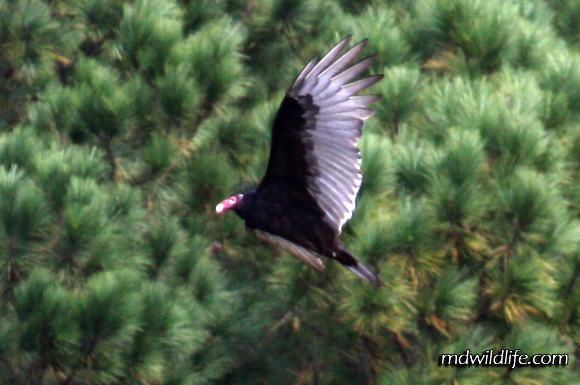 Turkey vulture gliding along the coast at Elk Neck forest. If you are wondering where to get them, Eastern Neck Island Wildlife Refuge may be the best spot to pick one out as they are abundant there, and there are plenty of open spaces available, which provide unobstructed shots. I had a great experience on Eastern Neck Bayview Trail once time, where I parked my car on the roadside and had a turkey vulture or two pass extremely close to my car through the large open field there. On another occasion I walked the Duck Inn Trail out to the water and a group of Turkey Vultures, both adults and some juveniles were sitting in the trees not 20 feet away from my location. I wish I had thought to bust out the video capabilities on my phone. My wife and I discovered some turkey vultures nesting in a hollow tree stump in the woods behind the house (Upper Marlboro). Very interesting and not at all shy/camera shy. However if you get too close they let you know with their hissing rattling sound they make. 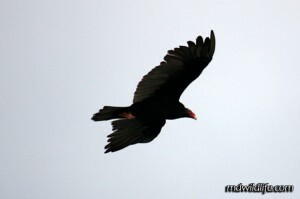 I have seen an adult turkey vulture yesterday evening around Rock Creek Park in Maryland. It was on East-West highway, around the intersection with Beach Drive, in Chevy Chase/Bethesda (MD). There is a very large flock of what I believe to be turkey vultures behind my house in Montgomery Village. We are near parkland and I think they nest in a grove of trees nearby. They come out in the morning and coast on the wind currents in different spots but in the same general area. This morning they were perched in the trees in back of my house for a couple of hours, which was kind of scary. I have not been able to get close enough, even with binoculars, to see their heads but the wings fit the description, the bill is hooked and yellow and I have seen a little bit of red without being able to make out more. while going through an abandoned house yesterday – l came across one -in a closet …as it scurried out, then flew out a window – l noticed two eggs in the closet ! ? . . . .is this at all a normal type of place for such….are they not nest builders ?